Forest Park, nestled between a neighborhood and busy streets, runs throughout the Woodhaven area of Queens. A little green space in the midst of a bustling borough where a small group of kids fill a baseball field as Greg Vasicek watches running coach Suzie Clinchy lead a group of autistic kids in warmups. Five boys, ranging from the age of six to thirteen, prepare for 45 minutes of running exercises. Vasicek is the founder of Play4Autism, a social sports support group. Since 2011, the inception of the organization, he has looked to partner with other groups working to support autistic children. He connected with Suzie Clinchy, who runs her own organization Fast Feet NYC, over the summer. He solicited her to come out and teach kids some fun and attention grabbing running techniques. Vasicek said the idea for Play4Autism came to him in 2010 on Christmas day as he walked along the West Side Highway. “I walked passed a family playing tennis and I just sat there watching,” he said. They had a daughter who, Vasicek noticed, had autism. When the father came up to ask him if he was alright, Vasicek said they got to talking about sports programs for people like her. “He said there’s not much out there for the kids,” Vasicek recalled. Many programs that incorporated sports for autistic children did not last very long. Vasicek explained he was inspired to create a new organization sports for autistic youths that could touch as many families as possible. Vasicek began jumpstarting the organization, he called up his sister who has a teenage son with autism, and told her his idea. According to the Center for Disease and Control, one in 59 children are on the autism spectrum. That statistic has risen from the year 2000, when one in every 150 children were considered to be on the spectrum. Vasicek is a former professional hockey player and coached players with disabilities overseas. He said anyone can play sports. He utilizes sports to give social opportunities to kids. The program has traveled to states like Arizona and New Mexico since 2011. He had set up programs wherever he was living at the time. 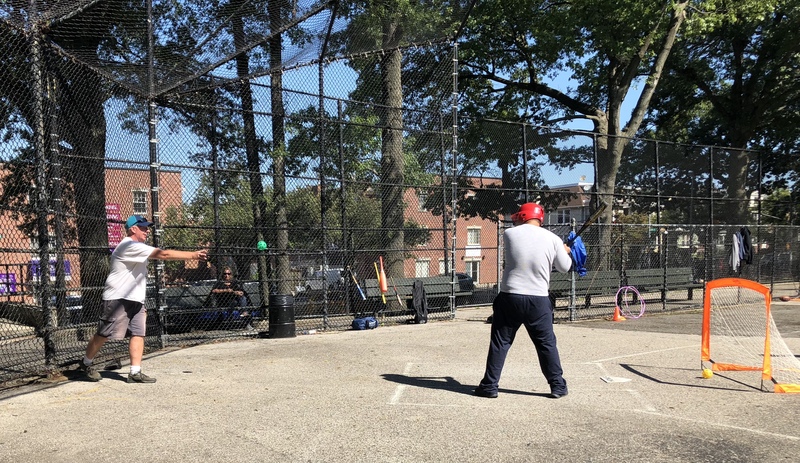 Vasicek said he decided to settle in Queens, New York about four years ago and the program has been welcoming new and returning members ever since then. Besides hosting Suzie Clinchy’s organization on Saturday mornings, Vasicek runs open sports on Saturday mornings and martial arts in the afternoons. The group has been looking forward to the return of gymnastics classes and bowling outings. Ameena Rodriguez was preparing her son for the next day. “Marcus is really looking forward to bowling,” Ameena Rodriguez said about her 12-year-old son. She said he looks forward to many Play4autism events. She explained how Marcus loves interacting with people and how friendly he is, especially after joining Play4Autism. “Marcus is the funniest, cool kid ever and I’m not just saying that because he’s my son,” Rodriguez said with a huge smile spreading across her face. She said Marcus sticks to a movie and watches it every day, but he knows every movie he watches word for word. “He loves to watch movies every day.” Rodriguez said. “He has a movie of the month and this month’s movie is Ice Age,” she said. Rodriguez explained how her son has echolalia, which means he repeats words that he hears, but he mostly repeats the lines he hears from movies. Parents like Rodriguez say they are thankful their children have a place to go where the stigma surrounding autism disappears. They acknowledge that friends who are parents of children who don’t have autism might not always understand. “As parents, you have that unison together and you have that one common goal which is to make our children better,” Rodriguez said. “He tries his best for every child on the autism spectrum,” Rodriguez said about Vasicek. Vasicek says he has always tried to foster a sense of community with the parents who are part of the organization. “A lot of the families, once their child is diagnosed, their families support them but their friends have changed because of what’s happened,” Vasicek said. Vasicek says he encourages parents to stay and talk to other parents or even participate in the day’s activity with their children. When he’s not hosting game-days, he occasionally runs evenings when parents can leave the kids at home and enjoy a night out on the town with some comedy and tasting wine. Krueger’s 12-year-old twin sons, Nicholas and Christopher, have been diagnosed with autism since they were three. He said social skills between the two were lacking from the beginning. The family originally signed up for Play4Autism more than a year ago to join the bowling program. The twins really like bowling, but their father says Saturday sports program gets the boys off electronics and out of the house. “Getting them away from something they’re very comfortable with is good for them, but also their health,” Krueger acknowledged. “I think it made the boys more aware of others around them besides themselves, like playing with other kids, listening to adults, taking directions better." Christopher has nothing but positive words about Vasicek and his programs. “Greg is smart, he’s very awesome, he’s very lovable and also dependable,” Christopher listed off. The twins agreed they both enjoyed playing kickball and after a little back and forth about who won, both boys agreed it was a tie. As for Play4Autism’s future, Vasicek is looking to raise funds for an indoor space. “We do a lot of fun fundraisers to raise awareness and for getting a center,” Vasicek said. “A lot of the kids look forward to coming out here weekly. It’s a routine for them.” And it is a routine Vasicek says he does not want to break.